This post comes to us from Fiona Stewart of the Financial Markets, Insurance and Pensions Division of the OECD’s Directorate for Financial and Enterprise Affairs. Those of us struggling with our commutes to work in France don’t need to be reminded that pensions are on the top of the agenda again in many OECD countries. Workers are understandably perturbed when they feel as if their hard earned right to a well deserved retirement is under threat. Yet, given the ageing of the population across the OECD region, the scale of the challenge of paying for our pensions is rarely understood. Without reforms, spending on pensions will require an extra 5% of GDP by 2050 – posing a much greater challenge to our economies on a long-term basis than the financial and economic crisis of recent years. We are all living longer – which is a good thing – and we are increasingly healthy at older ages. When pension systems were first introduced, the retirement age was 65 and life expectancy was 65. Now we might work for 30 years and be retired for 30 years. Lord Turner, who conducted a major review of the pension system in the UK a few years, ago spelt out the choices we have starkly – we can save more, live on less in retirement or work longer. Some say that corporations making big profits should be taxed more (the banks which were so involved in the financial crisis being singled out) or that governments should cover the rising cost of our pensions rather than individual workers. But this does not solve the problem that the costs of our pensions are ever rising and there are fewer and fewer young workers to pay for them. 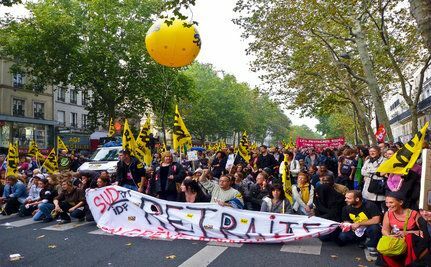 One particularly striking (being the operative word) fact in France is that young students are demonstrating against the rise in the retirement age. No one seems to be trying to explain to them that if these reforms do not happen they are the ones who will be hit hardest and have to pay in the long run – as they will have to pay for the decades of retirement their parents are likely to enjoy, whilst, when it comes to their turn to retire, there may not be enough money to pay for their pensions. To the great French cry of ‘Liberty, egality, fraternity’ should be added ‘intergenerational solidarity’! The complexity of the pension debate again means that the students are mixing the issue with other matters – notably arguing that if the older generation work 2 years longer, they will have to wait 2 years more until these jobs are ‘freed up’ and they can start work. Yet the experiment of the 1980s and 1990s recessions, when early retirement was used as a policy tool to try to fix unemployment, showed that these policies did not free up jobs, but in fact had the opposite effect, as the number of jobs within an economy is not a fixed pie to be shared out. Fortunately OECD governments have learnt this lesson and are indeed pushing ahead with raising the retirement age – as we saw in the UK this week. Some have also linked the retirement age to longevity increases, making the rise gradual and automatic which should avoid damaging political battles such as these in future. Sure our pension systems aren’t perfect – and neither are the French reforms. For example, there are still unanswered issues such as how to ensure women, who tend to have broken career paths for child rearing, receive more equal pensions, or how we should treat those in particularly strenuous or dangerous jobs, or the unfairness caused by differences in longevity across social classes. The 40 year contribution period to be introduced into France is fairly long by OECD standards, and arguably hits blue-collar workers more disproportionally But these issues should not cloud the core fact that working a few extra years in retirement is an essential step to putting our pension systems on a sustainable path and securing them for future generations. As France demonstrates, much still needs to be done by governments to communicate why pension reforms are needed and how we must not only share the costs of our rising longevity, but hopefully celebrate the fact as well. What – or who – caused the crisis? Slate offers not one but 15 answers to that question here. But if you’d like a more official response, you might like to keep an eye on the Financial Crisis Inquiry Commission (FCIC) in the United States, which is due to begin public hearings this week. The ten-member commission was set up by Congress with a sweeping mandate to investigate the causes of the crisis – everything from the possible role of fraud and abuse in the financial sector to the way bankers are paid. There are precedents for this sort of probe. In the early 1930s, the U.S. Senate’s Pecora Commission investigated the causes of the Great Depression, and “unearthed a secret financial history of the 1920s, demystifying the assorted frauds, scams and abuses that culminated in the 1929 crash”, according to Ron Chernow. That investigation had a long-term impact on the U.S. financial sector, leading to the establishment of the Securities and Exchange Commission (SEC) and the separation of commercial and investigation banking. Whether the FCIC will have the same impact remains to be seen, but its chairman, Phil Angelides, has made it clear that he wants the commission to ask – and answer – some tough questions. “You have millions of people unemployed, millions have lost their homes, and Wall Street is having a record year with record profits and record bonuses,” he told ABC News. “People want to understand why.” What questions should the commission ask? The New York Times and The Huffington Post have some suggestions. The Commission is due to report by mid-December 2010, but members have indicated they plan to post important findings on their website (under construction) before then.